PLAINVILLE - Last week was a record-breaking highlight for the Plainville High football team and its quarterback, senior Frank Griffin. He broke the Plainville school record for most rushing yards in a game as he ran for 323 yards and five touchdowns. He also threw for 99 yards and another score as the Blue Devils beat East Catholic 49-15 to improve to 4-3 for the season. Plainville will be looking to go 1-0 this week against visiting Tolland (3-4), a team that has multiple offensive weapons, but perhaps no real standouts. The Eagles have averaged 70.9 receiving yards and 156.1 rushing yards per game so far this season, with 19 total touchdowns. Tolland has two quarterbacks with more than 25 passing attempts each: juniors Ali Diaby (26-for-60, 285 yards, 2 TDs) and Aidan Clark (7-for-28, 120 yards, 1 TD). Junior running back Ryan Carlson has also made 13 pass attempts, completing five for 90 yards. Senior Collin Cook is the team’s leading rusher, with 66 carries for 339 yards and seven touchdowns. Carlson is not far behind, though, with 72 carries for 312 yards and four TDs. The team’s most versatile offensive skill player, Carlson also had nine receptions for 116 yards and all three of the Eagles’ three receiving touchdowns. Diaby has also carried the ball 49 times, for 195 yards and two TDs, while junior Aidan D'Amato has 18 receptions for 249 yards. Winning the battles in space will be key for Plainville this week. “We’ve got to be able to defend in space, we’ve got to be able to tackle in space, and do the reverse on offense - make blocks in space, make plays in space,” Shea said. “It should be a good game, an entertaining game,” he added. The Blue Devils will be happy to be in front of their home crowd after playing three of their past four games on the road and getting their first road victory just last week. 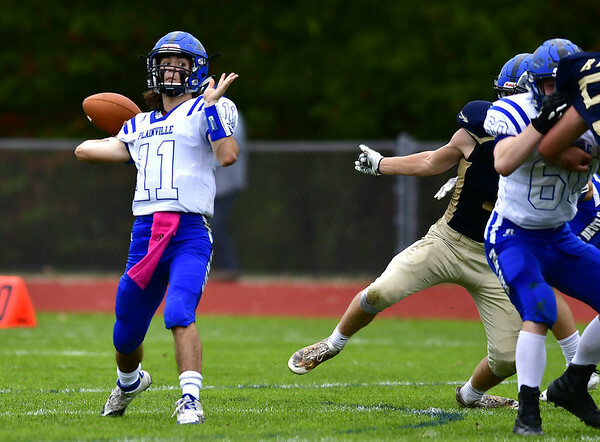 Griffin could break another record this week, as he’s just 127 yards shy of breaking the all-time passing record at Plainville High. The key to his success, and that of the team, will be tied to its preparation, just as it was last week. East Catholic played a lot of man-on-man defense and the Blue Devils won those battles. That all-around effort included a fine defensive performance, as well. The Blue Devils should be equally well prepared heading into tonight’s home game against Tolland. Posted in New Britain Herald, Plainville on Thursday, 1 November 2018 21:12. Updated: Thursday, 1 November 2018 21:17.